Today, in a long waited Declaration Of The Democratic Green Party of Rwanda, Mr. Frank HABINEZA’s party left the Permanent Consultative Council of the opposition parties in Rwanda-PCC. The FDU-INKINGI party takes good note of Mr. HABINEZA’s painful decision after many months of swings, panic, endless agony and unpredictable political position. This is a relief for all. Knowing the Machiavellian nature of the ruling party RPF and the never honoured iron-and-stick deals, we remain sceptical about this new marriage of convenience. This is the irony of a hunting predator, stalking his prey, waiting for one to go astray and be separated. We are always open to work with all those fighting for democracy, the rule of law, justice and a lasting solution to the Rwandan crisis. Though, Mr. Frank HABINEZA abandons his two co-founders of the PCC in maximum prison for politically motivated charges, we remain proud of what we have achieved together since the creation of the PCC in February 2010. The history will always remember our colleagues who were assassinated, like the late André KAGWA RWISEREKA, his Vice President, and we remain indebted to those courageously enduring the fist of the dictatorship and particularly those in detention like Ms. Victoire INGABIRE UMUHOZA, the Chair of FDU-INKINGI, and Mr. Bernard NTAGANDA, the Founding President of PS IMBERAKURI, or other democracy martyrs. The Democratic Green Party of Rwanda hereby stops its membership and responsibilities from the Permanent Consultative Council of Opposition Parties in Rwanda-PCC. 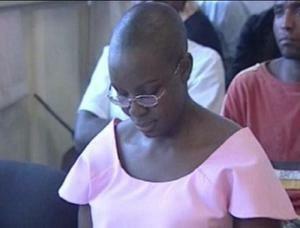 Kigali – Today 27th December 2010, Ms. Victoire INGABIRE’s lawyer has requested an immediate release order from the Intermediate Court of GASABO because the pre-trial detention order expired on 25th December 2010. The case has not yet been transmitted for evidential trial. Her detention is illegal. Paul KAGAME’s government has no legal basis to keep her in jail after the expiration of the ordinance. This is another proof of the politically motivated background of this case. We call upon Rwandans and the international community to send calls and letters demanding the immediate and unconditional release of democracy leader, Ms. Victoire INGABIRE UMUHOZA, Chair of FDU-INKINGI, illegally incarcerated in RWANDA in violation of Article 19 of the International Covenant on Civil and Political Rights, to which Rwanda is a signatory. She is detained in violation of articles 18 and 19 of the Rwandan Constitution and article 100 of the Rwandan Criminal procedure Law. “An order authorising for preventive detention remains in force for 30 days including the day on which it was delivered. After the expiry of that time, it can be renewed for one month and shall continue in that manner” (art.100, sub-section 3, Preventive Detention, LAW N° 13/2004 OF 17/5/2004 RELATING TO THE CODE OF CRIMINAL PROCEDURE, O.G SPECIAL Nº OF 30/07/2004). “The person’s liberty is guaranteed by the State.” (art.18, Constitution). “Every person accused of a crime shall be presumed innocent until his or her guilt has been conclusively proved in accordance with the law in a public and fair hearing in which all the necessary guarantees for defence have been made available. Nobody shall be denied the right to appear before a judge competent by law to hear his or her case”. (art. 19, Constitution). It is time to see if there is any institution or authority in Rwanda protecting the law or the national constitution. Leader of the opposition in Rwanda, Victoire Ingabire, has to spend her Christmas in a prisoncel in jail 1930, in Kigali. The ‘cel’ consists of a small space, a former office, with all the windows painted black. She sits in her cel with two female collegue-prisoners, who are in reality her spies: they hear every word she says and the follow all her movements. Ingabire is not allowed to leave her cel. She is not allowed to walk outdoors, so she never sees the sun, or gets any fresh air. Therefore she’s got respiritory problems. She’s allowed once a day to get her food from Alice Muhirwa, treasurer of her party UDF Inkingi, it gives her a ten meters indoor-walk The only time she sees any sun is when she has to appear in the courthouse. According to Muhirwa and Sylvain Sibomana, secretary of UDF, her physical condion is allright under the circumstances. Ingabire has to suffer the weekly humiliation of her had beeing shaved. She takes that bravely, says Muhirwa. Ingabire has eight! guards: three policemen in uniform with weapons, three men of the Criminal Investigation department, a female guard and a guard who commands all her other guards. But Ingabire is not intimidated, according to Muhirwa and Sibomana and she asks everybody to keep cool and to stay strong. Ingabire is not allowed to write anything, she doesn’t have a computer, she’s not allowed to have any contact with the other prisoners, or to give any interviews. In fact she’s living in total isolation. She’s got permission however to see every friday some of her partymembers. They come to see her from all over the country. In the meantime all the activities of UDF-Inkingi are influenced by Ingabires detention. The regime therefore has reached it’s goal. The situation can get worse if Muhirwa and Sibomana are sentenced to jail coming 5th of january. They have to stand trial for attending an illegal demonstration. “This is a political trial, with falsified charges and evidence”, Muhirwa says. Both partymembers find the silence of the international community remakable. “They seem to close their eyes to the situation in Rwanda. Instead the should make a powerfull statement concerning human rights and then political space.” Ingabire is not the only one in jail during Christmas. For example Bernard Ntaganda sits in the same jail since last summer. “The last few months we’ve seen a new wave of arrests of politicians, journalists and former members of the governmentparty RPF. They all have one thing in common: they critisize the government”, according to Sibomana. Please add your Christmas wishes to this global online Christmas card for Victoire Ingabire Umuhoza and Bernard Ntaganda, and for the Rwandan people, and African people of the wider region, who have suffered such brutal dictatorship and exploitation for so long. The AfrobeatRadio Collective will publish everyone’s good wishes, on AfrobeatRadio.net. Please include names and locations, unless doing so is cause for anxiety. Victoire Ingabire Umuhoza, Rwanda’s FDU-Inkingi opposition leader, is spending Christmas in Rwanda’s maximum security 1930 prison. We are sad to see you, two of the candidates who attempted to contest this year’s Rwandan presidential election, spending Christmas behind bars, in Rwanda’s 1930 maximum security prison. Your incarceration, even after the release of the October 1st UN Mapping Report documenting the Kagame regime’s war crimes, crimes against humanity, and civilian massacres in the Democratic Republic of Congo, is justice turned upside down, or rather, no justice at all. Though you will not even be able to read this card online or in print, we hope you may somehow hear of it and be heartened. Thank you many times over for your courage and strength. Kigali – 22nd December 2010. Today, a strong team of police officers searched again the detained opposition leader’s house in Kigali and confiscated office items. The aim is to harass and threaten the occupants until nobody stays in the house. After every police search, staff members resign. The last time, fearing for their lives and in panic, the private secretary and two house staff preferred to resign. This happens amid fresh political attacks. On 19th December 2010, President KAGAME told publicly an extra-ordinary congress of the ruling party that KAREGEYA, KAYUMBA, RUDASINGWA and Ms. Victoire INGABIRE are from the “wrong race” (ubwoko bubi) and that they will be defeated. Normally after the President gives the tone, there is either a police grilling, a Court hearing or an extension of the provisional detention. It is unthinkable to pursue this character assassination propaganda towards an innocent mother, already in maximum security prison with no trial. A fresh Intermediate Court hearing is likely this week due to the expiration of the provisional detention of Madame Victoire INGABIRE. The trial of two members of the Interim Executive Committee and other party members will start on 05th January 2010. In all provinces, members of the FDU-INKINGI party are facing excessive intimidation. The intimidation of Rwandans has now been extended to rural areas where the RPF administration has destroyed over 500 homes (huts) of the poorest peasants and ethnic BATWA without a proper resettlement . This inhumane operation should stop immediately. President Paul KAGAME and his government should fully respect the rights and freedoms of all Rwandans and release opposition leaders from Prisons. OPPOSITION LEADER MS. VICTOIRE INGABIRE TO SPEND CHRISTMAS IN MAXIMUM PRISON. The new bail application made by Madame Victoire INGABIRE, the FDU-INKINGI Chair, has been refused today at the High Court. She will remain in maximum prison until the National Prosecution Authority concludes its preliminary probe into a dozen of allegations and determines what charges it will finally file against the opposition leader. The politically motivated charges have been ever changing. President Paul KAGAME in May 2010 revealed that they had 10 “things” against her, but the prosecutor has so far reached 5 or 7 depending on in-court submissions or out-of Court propaganda. She was taken to the High Court in handcuffs but there was no judge to deliver the verdict, and finally the jailers informed that the Intermediate Court ruling was confirmed. Nobody knows yet the grounds for the judgment. How long Rwandans, friends of Rwanda and the international community will tolerate this humiliation? Information is filtering about new guilty pleas deals arranged by the police, the secret services and the Prosecutor. For example in Western Province 9 confessing suspects are in Gisenyi Prison; in Kigali City, 3 new witnesses have been contacted; in Southern Province 4 people have been forced by municipal authorities and the police to offer public apologies for enrolling in a “terrorist” organisation. The looming political crisis in Rwanda is deepening. It’s time for the United Nations, the United States of America, the United Kingdom, the European Union, African Countries , the African Union and other main partners of Rwanda to address this stalemate before the country sink and plunges into chaos. PARIS — A French judge has filed preliminary charges against six people close to President Paul Kagame of Rwanda, including the defense minister, over the 1994 assassination of the country’s then-president in a missile attack on his plane, their lawyers said Thursday. The six – some ranking Rwandan army officials – were charged last week over the killing of Juvenal Habyarimana, they said. The assassination was widely seen as a trigger to Rwanda’s genocide, in which more than 500,000 people, mostly ethnic Tutsis but also moderate Hutus, were massacred in 100 days of frenzied killing led by radical Hutus. Investigating Judge Marc Trevidic visited the Burundi capital of Bujumbura from Dec. 5 to Dec. 15, when the six agreed to be placed under investigation, said Bernard Maingain and Lev Forster, who represent all of the men. Trevidic and a team of experts visited Rwanda in September to try to determine the place from where the missile that brought down the presidential plane was fired. Preliminary charges give officials time to pursue a probe before deciding whether to send suspects for trial or drop the case, and give suspects access to court files. France is investigating the Rwanda case because the plane’s crew was French and died with Habyarimana, along with then-president of Burundi Cyprien Ntaryamira. Among the six people in question are ranking Rwandan army officers, including James Kabarebe, who has been Rwanda’s defense minister since April, Charles Kayonga and Jackson Nkurunziza, the attorneys said. The remaining three were identified as Jacob Tumwine, Sam Kaka and Franck Nziza. “The Rwandan government hopes that this is the first step toward the comprehensive conclusion of this unfortunate case based on political manipulations by people interested in destabilizing Rwanda,” he said. In November 2006, a now-retired anti-terrorism magistrate, Jean-Louis Bruguiere, delivered nine arrest warrants against people close to Kagame, all suspected of participating to various degrees in the April 6, 1994, attack. The six handed preliminary charges are among the nine, the lawyers said. The warrants triggered a break in diplomatic ties between France and Rwanda – re-established only in 2009. President Nicolas Sarkozy visited the Rwandan capital of Kigali last February, the first visit to Rwanda by a French leader in 25 years. “Rwanda’s government believes now that the investigations have been officially opened, the truth will come out for the whole world to know that the officers in question are not responsible at all for shooting down the plane on April 6, 1994,” Rwanda’s justice minister said. A Rwandan government-commissioned inquiry published in January concluded that Hutu soldiers shot down the Hutu president’s plane because they were opposed to a powersharing deal he backed. The French probe was opened in 1998 on complaints filed by the families of the three crew members killed. It is one of several investigations into the genocide.